Photographic Data from Ordinarily (but not invariably) Authoritative and Richly Illustrated Accounts Can Be Expanded. 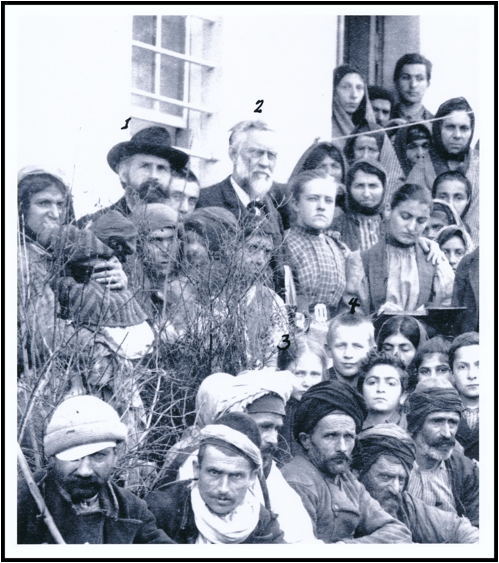 A case of an incorrectly attested photograph in a 1906 issue of the French journal Le Tour du Monde shows a young Ruth A. Parmelee, her brother Julius and father, Dr. Moses P. Parmelee in Trebizond 1895 at the Time of the Hamidian Massacres! There is ample evidence on the Internet that younger Armenians, especially those outside Armenia, often seek their roots and ask questions such as ‘Who are we? Who were we?’ ‘What was it like in Old Armenia?’ Photographs of the old country before the Genocide are especially interesting and valued, and there are a number of places and sites on the Internet where one can retrieve photographs retrieved from various archives and books. Although we are always interested in locating good quality photographs and imagery, we necessarily take what we can get — at least as a starting point. The French-language serial Le Tour du Monde: nouveau journal des voyages published in Paris by Libraire L. Hachette starting in 1860 (until 1914, when 88 volumes had been published) offers some very good illustrated travel accounts to Turkish and Russian Armenia. This is to us rather uninformative since the photograph is not large enough to allow really close examination of the range of “specimens” or “types” in the photograph. Perhaps we are too demanding but the decidedly ‘oriental’ garb of the men with varying kinds of headgear and the women with shawls drawn over their heads is somewhat illustrative of clothing worn by villagers and peasants but that is not very surprising, especially nowadays. These could themselves be the subject of a paper. However, to allow the reader to make a closer examination we provide an enlargement of the photograph. All well and good. One might suppose on the grounds of the dated article (underlined in red on the full-page scan above) that the photograph that we are talking about derives from the early1900s at the city of Van. Not so. It’s at Trebizond (Trabzon in Greek). But the photograph is much more interesting than that. We have been fortunate enough to have traveled extensively and taken advantage of the opportunity to visit various archives and libraries where illustrative materials associated with various Armenian “persecutions” including the Hamidian Massacres, the Cilician Massacres and the Genocide are housed. One of these is the Hoover Institution Library and Archives at Stanford. It is a very rich resource for a broad range of information. Because of our special interest in the Kharpert region, we have necessarily sought out archival materials connected with Ruth Azniv Parmelee. She was born in Trebizond, Turkey of missionary parents , and earned her M.D. at the University of Illinois Medical School in 1912 and spent time at the Philadelphia Women’s Hospital before going to Harpoot where she served. Following the Smyrna disaster and Holocaust she went to Greece and was the director the American Women’s Hospital in Dokkinia. She died at the age of 88 in Concord, New Hampshire. “Miss Chambers”. The numeral 5 is barely visible. Number 3 is Ruth. All that glitters is not necessarily gold, but it just might be. The lesson is to use all sources with caution and do everything possible to verify. Original prints can make a big difference when examining photographs for any number of reasons, not the least of which is that you can usually see them much more clearly. There seems to be a resurgence in interest in the life and work of Dr. Ruth Azniv Parmelee, and we must say that so far we are not impressed with that which has been done. Much of it is derivative, and the required effort to dig deep has clearly not been expended. There are plenty of Parmelee archival materials available other than those at Hoover. Perhaps one day we can cover some of that material. We again acknowledge and sincerely thank Hoover Institution at Stanford for allowing access to the Ruth Parmelee Papers and photos. Ce Que L’On Voit en Arménie 20 Octobre No. 42, pgs. 493- 504. 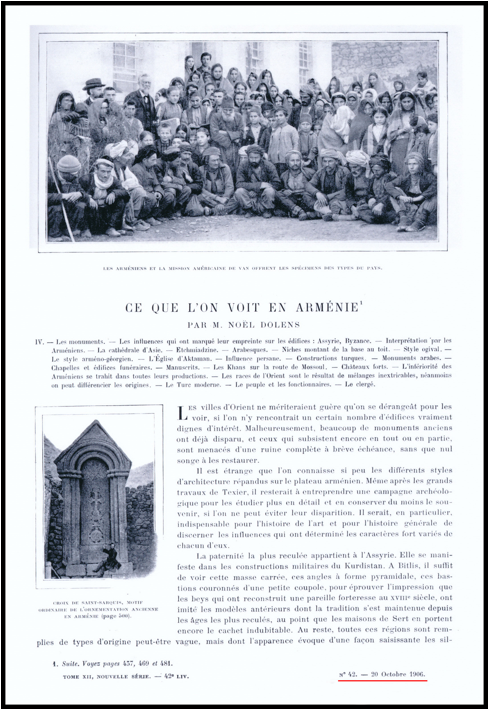 We have not spent much time trying to learn more about Dolens but have come across an e-publication of a work in Dutch entitled Wat er te zien vaalt in Armenie: De Aarde en haar Volken, 1907-1908. This was scanned as part of the Gutenberg Project (http://www.gutenberg.org/files/19306/19306-h/19306-h.htm). There is also a French title, Histoire des anciens Arméniens, published in 1907, which credits Dolens as the author and one “A. Khatch.” It was published in Geneva, Switzerland under the Imprimatur of the Union of Armenian Students in Europe. A translation of this work into Armenian, listed in the collections of the British Library but not seen by us, provides the year 1909-1910, and a statement that it was translated by “R. Kajberuni” – presumably the same “A. Khatch”. The translation was printed in Tiflis. A copy of Histoire des anciens Arméniens scanned from the University of Illinois copy, lacks illustrations. Other printings of the French version apparently have some illustrations but we have not bothered to track these down and examine them. Concerning the Dutch title described above, we are told: “This file should be named 19306-h.htm or 19306-h.zip ***** This and all associated files of various formats will be found in: http://www.gutenberg.org/1/9/3/0/19306/ Produced by Jeroen Hellingman and the Online Distributed. Proofreading Team at http://www.pgdp.net/. The illustrations show up rather well in the Dutch book. 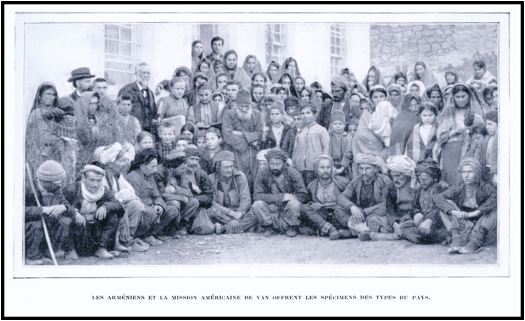 See for example, our Groong article “Filling in the Picture: Postscript to a Description of the Well-Known 1915 Photograph of Armenian Men of Kharpert Being Led Away under Armed Guard” posted on June 13, 2011 at http://www.groong.org/orig/ak-20110613.html. 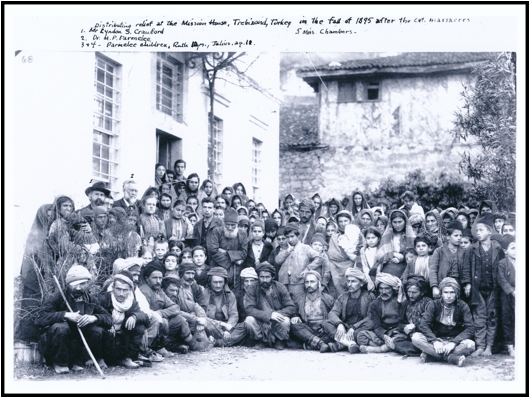 Also see on Groong January 6, 2014, our “Christmas Celebration For Armenian Orphans in Mezreh (Kharpert) January 8th, 1920: From Letters And Photographs.” Ruth A. Parmelee’s parents were Rev. Moses Payson Parmelee, M.D. (1834-1902) and Julia Farr Parmelee (1840-1916). Ruth Azniv Parmelee was born in Trabzon 13 April 1885 and died in Concord, New Hampshire 15 December 1973. Moses Parmelee wrote a very interesting book entitled Life Scenes among the Mountains of Ararat (Sabbath School Society, 1868). It has some small but quite well done woodcuts in it—for instance, the frontispiece image gives a view of Erzroom. We have not taken pains to identify the first name of “Miss Chambers.” What seems certain is that she was a daughter of Mrs. Cornelia Pond Williams Chambers, missionary wife at several stations, including Adana during the massacres etc. “All research, selection of photographs and scanning was done by Abraham D. Krikorian and Eugene L. Taylor. Without their efforts this online collection would not have been possible.” [See http://dcollections.oberlin.edu/cdm/search/collection/relief]. We have undertaken our projects as labors of love; we have also taken care of all costs connected these projects. We do not do them for credit or recognition. Even so, it would be nice on occasion to see a tiny bit of credit given for our efforts when appropriate. And, the caption to the Harput Relief Station group in 1919 took more than a little work, and certainly falls into that category.